I even tried to smile at him or look him in the eye, and he completely turned away. So that was surprising, because I thought he was supposed to shake all of our hands. 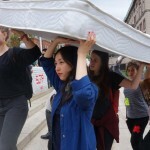 The mattress had been between Ms. Sulkowicz and Mr. Bollinger and that no snub was intended. The administration isn’t really paying attention to what’s important. They’re dancing around the issue, saying it’s not really Columbia’s problem but society in general’s. Though they’re the people who are not expelling the rapists. As a trans man, I feel sometimes that … I need to be involved in the male part of it. The entire reason that assault happens is because of the attacker, not the victim.